Assessment of risk is an important component of good risk management, but before a pilot can begin to assess risk, he or she must first perceive the hazard and attendant risk(s). In aviation, experience, training, and education help a pilot learn how to spot hazards quickly and accurately. Once a hazard is identified, determining the probability and severity of an accident (level of risk associated with it) becomes the next step. For example, the hazard of a nick in the propeller poses a risk only if the airplane is flown. If the damaged prop is exposed to the constant vibration of normal engine operation, there is a high risk that it could fracture and cause catastrophic damage to the engine and/or airframe and the passengers. Differentiate, in advance, between a low-risk flight and a high-risk flight. Establish a review process and develop risk mitigation strategies to address flights throughout that range. For the pilot who is part of a flight crew, input from various responsible individuals cancels out any personal bias or skewed judgment during preflight planning and the discussion of weather parameters. The single pilot does not have the advantage of this oversight. If the single pilot does not comprehend or perceive the risk, he or she will make no attempt to mitigate it. The single pilot who has no other crewmember for consultation must be aware of hazardous conditions that can lead to an accident. Therefore, he or she has a greater vulnerability than a pilot with a full crew. Assessing risk is not always easy, especially when it involves personal quality control. For example, if a pilot who has been awake for 16 hours and logged over 8 hours of flight time is asked to continue flying, he or she will generally agree to continue flying. Pilots often discount the fatigue factor because they are goal oriented and tend to deny personal limitations when asked to accept a flight. This tendency is exemplified by pilots of helicopter emergency medical services (EMS) who, more than other pilot groups, may make flight decisions based upon the patient’s welfare rather than the pilot’s personal limitations. These pilots weigh intangible factors such as the patient’s condition and fail to quantify actual hazards appropriately, such as fatigue or weather, when making flight decisions. Examining National Transportation Safety Board (NTSB) reports and other accident research can help a pilot learn to assess risk more effectively. For example, the accident rate during night visual flight rules (VFR) decreases by nearly 50 percent once a pilot obtains 100 hours, and continues to decrease until the 1,000 hour level. The data suggest that for the first 500 hours, pilots flying VFR at night might want to establish higher personal limitations than are required by the regulation and, if applicable, become better skilled at flying under instrument conditions. 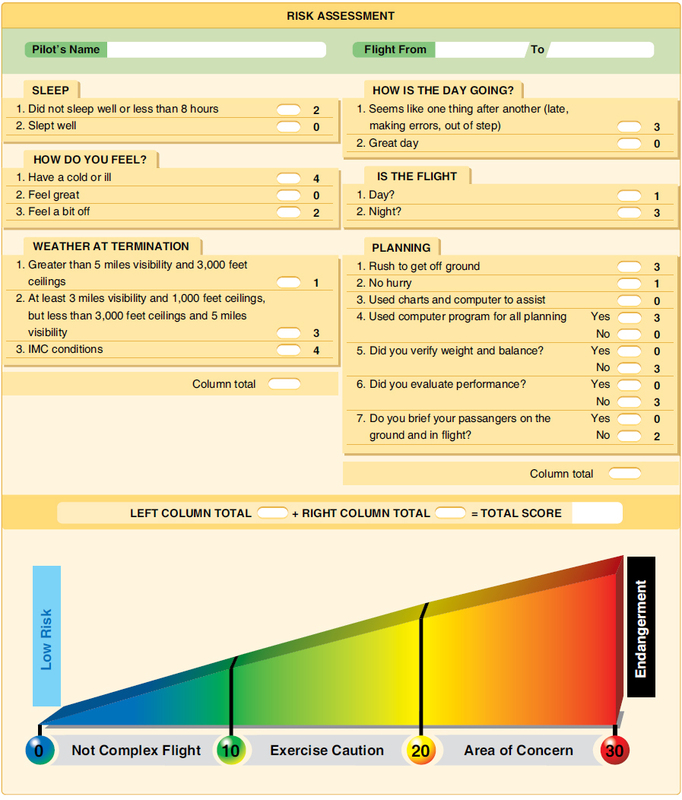 Several risk assessment models are available to assist the pilot in determining his or her risk before departing on a flight. The models, all taking slightly different approaches, seek the common goal of assessing risk in an objective manner. The most basic tool is the risk matrix. [Figure 4-1] It assesses two items: the likelihood of an event occurring and the consequence of that event. Figure 4-1. 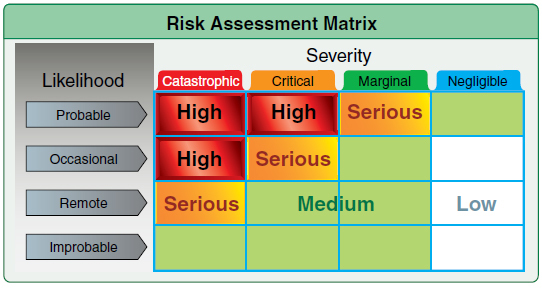 A sample risk assessment matrix a pilot can use to differentiate between low-risk and high-risk flights. Likelihood is nothing more than taking a situation and determining the probability of its occurrence. It is rated as probable, occasional, remote, or improbable. For example, a pilot is flying from point A to point B (50 miles) in marginal visual flight rules (MVFR) conditions. The likelihood of encountering potential instrument meteorological conditions (IMC) is the first question the pilot needs to answer. The experiences of other pilots coupled with the forecast might cause the pilot to assign “occasional” to determine the probability of encountering IMC. The other item in the matrix is the severity or consequence of a pilot’s action(s). It can relate to injury and/or damage. If the individual in the example above is not an instrument flight rules (IFR) pilot, what are the consequences of encountering inadvertent IMC conditions? In this case, because the pilot is not IFR rated, the consequences are potentially catastrophic. The following are guidelines for this assignment. Simply connecting the two factors as shown in Figure 4-1 indicates the risk is high and the pilot must not fly, or fly only after finding ways to mitigate, eliminate, or control the risk. Although the matrix in Figure 4-1 provides a general viewpoint of a generic situation, a more comprehensive program can be made that is tailored to a pilot’s flying. [Figure 4-2] This program includes a wide array of aviation related activities specific to the pilot and assesses health, fatigue, weather, capabilities, etc. The scores are added and the overall score falls into various ranges, with the range representative of actions that a pilot imposes upon himself or herself.